For permanent disinfection and odour control in aircraft toilets. 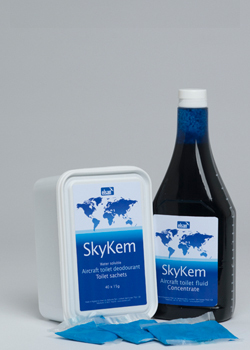 SkyKem aircraft toilet cleaning fluid and sachets are manufactured exclusively for the airline industry to provide unbeatable hygiene and odour control in passenger aircraft toilets. A unique combination of detergent, scale inhibitor and de-odouriser prevents foul odours and keeps aircraft toilets clean and fully operational. Passengers and crew will notice improved performance from recirculating toilets while ground handlers will benefit from improved hygiene safety in disposing of waste that has been correctly treated before removal from vacuum waste tanks. SKYKEM is manufactured by Elsan, World Leaders in chemical sanitation and aviation suppliers since the 1920’s. SkyKem fluid and sachets can be delivered world-wide. Fast Acting - SkyKem is manufactured to exceed the rigorous standards of the World Health Organisation and attacks all micro-organisms and viruses within 30 minutes. Long Lasting - Powerful biocides continue to breakdown and kill the pathogens in the toilet waste system for up to 72 hours. It is SKYKEM’s unique combination of biocides that remove bad odours by effectively killing the bugs that create the problems. Permanent Air-Freshener - SKYKEM slow release fragrance acts as a long lasting deodorant and air freshener boosting performance every time the toilet is flushed. Washable dark blue colourant- SKYKEM contains a non-staining strong blue colorant manufactured from vegetable extracts that washes out of materials and loses its colour during exposure to daylight. Non-tarring and attacks lime-scale -SKYKEM is the best product available for reducing the tarring effect experienced in aircraft waste systems. It also contains lime scale inhibitors that help keep the waste system and pipe work clear. SKYKEM technology is designed with experience to meet every objective. Cleaning the toilet system, tanks and pipe-work, attacking microorganisms and decease, preventing foul odours, improving air quality and maintaining hygiene standards for passengers, cabin crew and ground handlers. SKYKEM passes every single protocol of the latest AMS requirement, AMS 1476B. This includes the separate storage stability tests. SKYKEM passes Air Canada anti-microbial tests (including their unusually severe tests involving raw sewage, not just yeast cultures). SKYKEM was uniquely specified as the only product acceptable for use on BA’s prestigious Concorde Service. SKYKEM passes Macdonald Douglas CSD No 3; exceptionally this includes parts 5 & 6 testing the efficiency of the product. SKYKEM is suitable for top dosing re circulating toilets or adding to the toilet water carried in the toilet bowser. It is also biocidal and can be added to the waste tank of vacuum systems to sterilize the waste. Sachets are designed for “top dosing” individual toilets. We recommend using fluid to dose the water in a reservoir tank on a toilet truck/cart. Alternatively the following number of sachets can also be used.